Time has changed those days when it come to coding, everything it’s away more complex than before, solutions and technologies had evolved enormous to provide the excellent dynamic that most of current websites enjoy. The Advanced Post Types Order plugin follow the trends and provide the ultimate framework for making sort of WordPress content, through a flexible extensible code. Practically any area on the theme can be re-arranged no matter the complexity of the back driven query. Consider the following scenario, a custom post type called Portfolio, a custom taxonomy called Portfolio Categories, a custom page template called Portfolio Template. We select two terms called Jewelry and Jordan King. At this moment, there is no custom sort applied on Portfolio posts displayed through Portfolio Template, except the default which can be by date, ID etc. Chose the Portfolio from post type dropdown. Chose Portfolio Categories from Taxonomy area. Once the list of terms update on the right, chose the very same terms we had previously chose on Portfolio Template, which would be Jewelry and Jordan King. The Taxonomy Operator should be set as IN (depending on template query this may need to be set for AND). 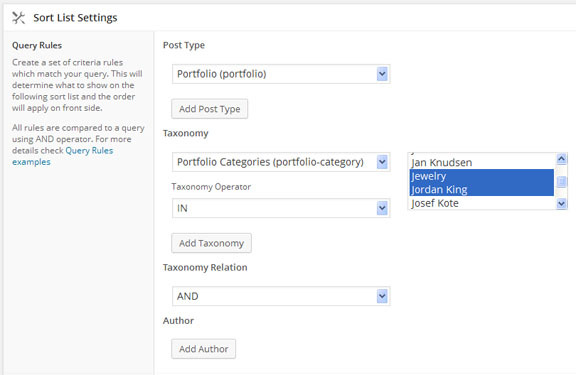 After the sort settings save, the Portfolio posts which match the above query will show within the sort list, allowing a manual / automatic order to apply. If the Auto Sort is set On the order will apply automatically on front side for Portfolio Template.